The gutters on your home play a very important role in the overall well-being of your property. Without gutters, rain would fall on your roof and then roll directly down the side of your home and pool around your foundation. Over time, this could cause your foundation to crack and crumble and promote mold and mildew growth on your home’s exterior. This is why it’s essential for homeowners to make sure their gutters are in good working order, and do whatever they can to prolong their lifespan. Clean leaves and other debris from your gutters on a regular basis. 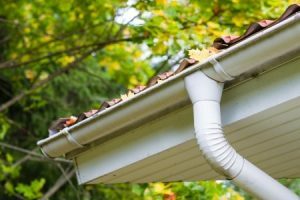 When leaves and other debris are allowed to build up in your gutter, they can start to decompose and cause damage to the inside of your gutters. They will also prevent water from moving through your gutter system, and ultimately cause water to spill over the sides of the gutters down to the ground. Cleaning your gutters out once or twice a year is easy, and it will prevent you from having to deal with these issues. Do you have a tree that with branches hanging over your home? You should trim back any growth that could potentially fall off and hit your gutters. Small twigs and branches probably won’t do much damage, but a single large branch could knock a gutter right off your home and shut down your entire gutter system until you’re able to get it repaired. Inspect your gutters and make sure water is flowing through them. The next time you have to go up on your roof, bring a hose with you and spray some water into your gutters. If your gutters are working properly, the water should flow smoothly to the nearest downspout. If they aren’t, the water will likely just sit there, or worse, flow in the wrong direction. In that case, you may need to have your gutter pitch checked and corrected. You want water to flow through your gutter system as quickly as possible, not get stuck in the gutters and stay in the system. 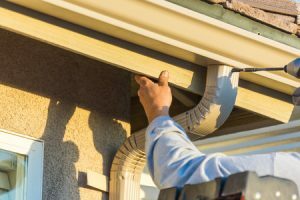 Is it time to install new gutters on your home? Don’t wait until your gutter system breaks down and stops working effectively. Bell Seamless Gutters can handle gutter installation for you and show you plenty of great new gutter options. Give us a call at (800) 597-1616 to learn more.